Macbook Pro users need not worry about the screen breaking or having problems because Macbook Pro screens are well developed to resist such occurrences but in extreme conditions, such screens could break or develop problems. Hence, the need for Macbook Pro Screen Replacement. Are you in need of a Macbook Pro Screen Replacement? If yes, then you have no need to worry about the whole thing because there are various ways to handle it perfectly without losing your precious Macbook Pro. I will also recommend the very best of the methods. Slacken adhesive strip on both sides which holds glass in place with the use of a heat gun. Gradually disconnect the glass from the assembly holding the display with the aid of a good suction cup. Apply a little force to the cup. Apply more heat on the strip if any form of resistance is encountered until it becomes easy to pull apart. Keep the glass in a clean place. There are two small screws on both sides firmly holding the LCD to the display frame. Unscrew all the screws with a screw driver. Gently slide the clutch wrap to the side and pull upwards gently to remove. Slacken the LCD from the assembly of display by flipping forward. 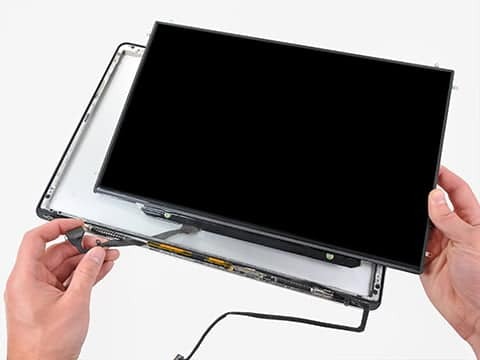 Detach LCD from the display assembly by gently removing the LVDS cable from the opening at the bottom of the display frame. After your Macbook Pro Screen Replacement, follow steps 1-6 in reverse to couple back your unit. Macbook Pro Screen Replacement is a delicate process such that one could end up causing more damage to his Macbook Pro if the rules are not followed fully and this could lead to spending much more money than is necessary. Your Macbook Pro Screen Replacement can be fixed by our experts at affordable rates. All you need to do is to give us a call and we will take it up from there. Macbook Pro Screen Replacement is quite cheaper than you think.